Small bathroom renovation ideas can make any bathroom into a big deal. Tip #1 - Maximize storage space with floating shelves, container storage, wall-mounted storage or even a floor to ceiling cabinet (perhaps with a mirror on the outside!). Tip #2 - Add mirrors to enhance the space. Tip #3 - Swap out an old window for a decorative glass window that becomes a focal point of the room. 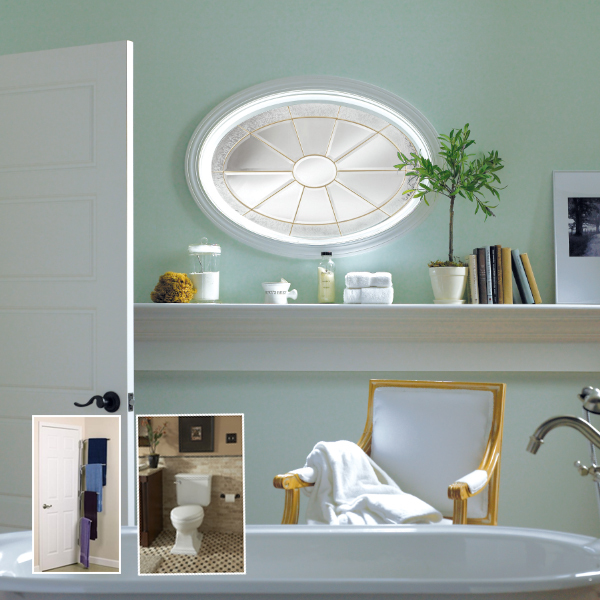 Styles from Hy-Lite include operable versions to allow air flow into the bathroom. Tip #4 - Create a fuller space feeling with well-placed lighting. Tip #5 - Add a stylish toilet that makes a design statement in the bathroom and ties in with 2016 bathroom trends! Consider one of the toilets from the Affordable Suite Collections from Mansfield Plumbing. Tip #6 - Create privacy areas by using obscure acrylic block walls to separate the toilet area from the sink. Tip #7 - Keep it light. Use brighter colors, like tones of whites, grays and beiges to create an open feeling. Tip #8 - Add texture with glass tiles, mosaics or grained wallpaper. Tip #9 - Stagger towel racks on the walls and add a Clutterbuster Family Towel Bar from Hinge-It . The rack stores behind the door and has four parallel bars for drying and storing towels. Tip #10 - Forget shower curtains and frosted glass showers. Use a glass door on the shower to help make the room look bigger.